In July, John de Jong, A78, V85, took the helm of the American Veterinary Medical Association, which represents more than ​91,000 veterinarians. 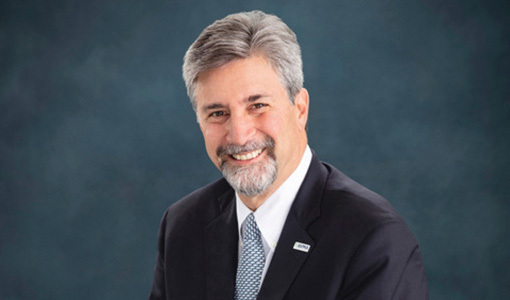 In electing him, the group found a leader with extensive business and advocacy experience, as well as an enthusiastic voice for veterinary medicine who’s comfortable communicating directly with the public. We asked de Jong about the challenges and opportunities ahead for the veterinary profession. Here, in his own words, is what he had to say. Every single day, someone’s life is touched by a veterinarian. However, I believe we haven’t done a good enough job promoting the breadth of what the veterinary profession does for the public. Whether you realize it or not, a veterinarian has played a huge role in producing and keeping safe the food you eat, creating the medical therapies you and your family benefit from, protecting you from diseases that could travel across international borders, and supporting the bond you share with your pet. My goal during my presidency is to help make the AVMA acronym as familiar and important to the public as the AMA and the ADA, by showing how we work at the crossroads of human, animal, and environmental health. We must find solutions for student debt. Veterinarians graduate with day-one competencies: They can hit the ground running to provide excellent animal care that translates into public health and human health—but that comes, on average, with well over $150,000 in student loans. Veterinary starting salaries of around $78,000 a year pale in comparison to the other health-care professions, despite the education and training being the same. Young veterinarians suffer from depression at higher rates and have a higher risk of suicide than other health-care professionals, and part of the reason why is this financial burden we bear, as well as compassion fatigue. We are working with a coalition in Washington, D.C., to reduce the interest rates on federal loans, and the AVMA is exploring options for providing new grads and veterinary students with loans at lower interest rates. We are facing a shortage in food-animal veterinarians. Much of the food-animal production in this country has historically been done in fairly rural areas, and you see far fewer private mixed and large-animal veterinary practices working there, because they can’t make a living. The federal government offers student-loan forgiveness for health-care professionals who work in underserved rural areas, but there is not nearly enough funding available to send enough veterinarians to all the areas that need them. The AVMA met with U.S. Secretary of Agriculture Sonny Perdue in December, and he’s committed us to helping us if he can through the Veterinary Medicine Loan Repayment Enhancement Act. It would provide better opportunities for veterinarians to pursue work in keeping livestock animals healthy and productive and our food supply safe. Veterinarians have many opportunities to help society. Antimicrobial resistance is one of the most serious threats to human and animal health today, and veterinarians can serve as stewards for the appropriate use of antibiotics, especially in our food-production animals. People increasingly wish to travel with dogs, cats, and other species working as service and therapy animals, and the AVMA is helping airlines—and perhaps soon the FAA—to establish procedures for flying responsibly with these animals. The AVMA also has established a new telehealth policy in recognition of digital-communications technologies’ potential to improve animal health and welfare in rural areas.